This issue is not related with app but with the map. I checked the code and also the Mexico LoMaps (POI DB) itself and the issue is already fixed or improved in LoMaps (as menion wrote). I guess that official Mapsforge V4 generator does not handle missing local names. Have you tried OAM V3 maps? I suggest you ask on the OAM forum. If this is a bug, Christian is likely to seek to correct it. It's a minor issue, and I can live with it. But I thought I'd mention it, since it was me that brought up the related earlier issue with LoMaps. I'd used V3 in all my OAM maps up till now, but thought I'd try V4, because theoretically newer is better, right? Now I'm not so sure. So V3 uses menion turbo-optimized-code and V4 uses off-the-shelf code? I see V4 gives far fewer theme options, but at least the matching Elements/Elevate are there. Yes this is correct. All V3 maps use or internal modified mapsForge version from, hmm maybe three years old. Maps based on V4 generator use in latest Locus Map version, MapsForge in version 0.9.0 . You may at least compare speeds, but I still expected that modified old version will be faster in most cases. If not, it will be positive information for me. First of all: Happy New Year, everyone, especially Menion! Now yesterday I stumbled over a rather serious bug with the track editor. Import the attached track. The start looks like in Before.png. Mark point 4 and "Delete all before"
Now select a point further on, e.g. 7, do Insert/edit again and move it just a little. Now the whole section is jumbled up - After.png. In step 3 it's important to move at least two points, and beginning with the first point of the track. Otherwise everything is fine. New Beta crashes when launched on Android 4.2 and 4.3. V 5.0 works. Thank you so much, Menion. The new overview map feature works like a charm. In also like the fact that only offline DB files are presented. No need to traverse file trees. How do you get the overview map to work? I get Disabled in settings and can't change the setting. I have the hidden world map from the Locus Store downloaded and working. I had a number of MBtiles maps on the Smartphone on external SD that Locus already "knew", and they simply appeared. So I did not (yet) start from scratch, but rather simply enjoyed the feature. 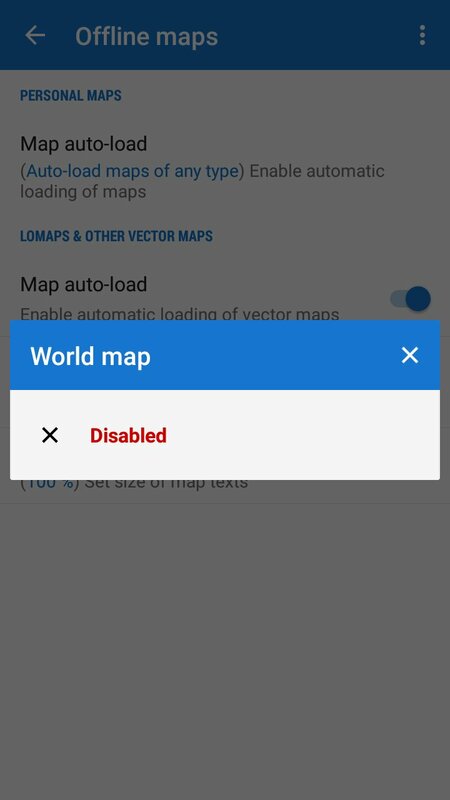 I tried on a second phone and the longer list of raster maps appears just below the "disabled" top line. The maps I see are all in a SD card folder that I explicitly added to the Locus search path, like on the first phone. BUT the raster maps that are in the "Maps" folder of the Locus main folder are NOT offered. I'll play a bit to find a pattern. I just downloaded an old SQLITE (not MBTILES) overview map from OAM and this one ended up in the "Maps" sub-folder of the Locus main path. - FC in photos ... as you may see, I did not yet looked it, sorry. Crash on Android 4.2 here too. 2. Quite frequently the beta app opens to a blank white map. Zooming in or out redraws the map correctly. I think this may be when it should be displaying the world map but I'm not sure yet.